SXS Fitness offers a variety of training options to suit each individuals needs - whether you are an elite athlete training for the junior olympics, or a weekend warrior trying to summer figure. We also offer group or tream training sessions and scheduled classes at our new training facility. Click on the links to view the various training options. 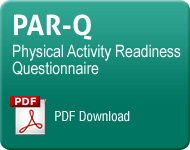 All clients are required to fill out a PAR-Q form for insurance and liability issues. Download and fill out if you haven't already.